The slimmer 26″ x 52″ x 42″ Transfer26 L-Shaped Outward Swing Door Bathtub was engineered to suit those with limited mobility or bathers who use a wheelchair. An extra wide, L-shaped outward swing door provides easy and comfortable slide in access for bathers of all types. Pre-installed grab bars and a textured, slip-resistant floor allow the bather to enter and exit with confidence. Once inside, the easy-to-reach faucet, controls, and pull-out hand shower provide a convenient bathing experience. Check out our variety of packages including features like the exfoliating Infusion™ Microbubble Therapy, soothing air, hydro, or dual massagers, and more. The Slimmer Transfer26 Wheelchair Accessible Walk In Tub was engineered to suit people who use a wheelchair and those with limited mobility. Bathers using a wheelchair can enter with ease from the side of the bathtub. The large entry through the wide, L-shaped outward swing door allows the bather to hold on to the deck- and wall-mounted pre-installed grab bars as they slide in or out of the walk-in tub bathtub. The Transfer walk-in bathtub is made with a textured, slip-resistant floor, 1 U-shaped, deck-mounted grab bar, and 1 interior sidewall-mounted grab bar. A soothing experience awaits inside. The 20” wide molded seat lets you bathe in a comfortable upright position. You’ll have easy access to your choice of faucet, optional premium feature controls, and the pull-out hand shower for a convenient bathing experience. Check out our variety of packages including features like the exfoliating Infusion™ Microbubble Therapy, soothing air, hydro, or dual massagers, and more. The 5 Piece Faucet Set includes a deck mounted thermostatic control valve, spout, pull-out hand shower, spout diverter, and pull-out shower diverter. The defining feature is the Deck Mounted Thermostatic Control Valve, which has an anti-scald feature that keeps the water at a consistent temperature and prevents water from suddenly shifting to unsafe temperature levels. Fill time with this faucet is 7-8 gallons per minute based on your home plumbing conditions. The Huntington Brass 5 Piece Fast Fill Faucet Set includes a spout, pull-out hand shower, hot and cold on/off levers, and a diverter. This fast fill faucet has a fill rate up to 18 gallons per minute based on your home plumbing conditions. ¾” supply lines offer a higher rate of water flow compared to standard ½” lines. Please keep in mind that flow rate can vary based on your homes plumbing conditions and water pressure. The Jandon Retro 5 Piece Faucet Set includes a spout, pull-out hand shower, hot and cold on/off levers, and a diverter. The ½” supply lines allow for a fill rate of 12-16 gallons per minute based on your home plumbing conditions. When it comes to controls we offer two options: Push Control or Digital Control. Our push controls are easy to use push down buttons that will operate your chosen jetting and any additional features such as the Chromatherapy LED light. The digital control is our more modern option, giving you a digital keypad from which to control your jettings and additional features such as Chromatherapy LEDs and heated seat & backrest. Both are excellent options and provide all the functionality needed to fully enjoy our walk in bathtubs. Advanced radiant heaters provide soothing comfort directly to the seat and backrest so you can be sure to remain comfortable and warm while your walk-in bathtub fills. Gone are the days of being cold while waiting for your tub to fill with this wonderful option. A simple to operate easy to reach push button on/off switch comes installed when this option is selected. LED Chromatherapy includes an LED light and an easy to use on/off push control. The LED light cycles through various colors and illuminates the entire water for a beautiful and soothing experience. Color has often been used in the past as treatment for illnesses. Since 1876, people used light waves to rid the mind and body of ailments and this is what is referred to as Chromatherapy. It is believed that each color has a different healing property. The included push control allows you to control the LED light, you can choose to have it cycle through a spectrum of colors or you can manually cycle it to your favorite color and have it hold there. Ozone is a proven water disinfectant. NuWhirl’s micrOzone generator targets tub plumbing where water can remain after baths, creating a higher concentration of ozone than many larger units. Its size—the smallest in the industry—means simple and ﬂexible installation. Our easy to use aromatherapy system can help you relax and recuperate. Relaxation can be induced by all five senses, especially smell. This is why we offer this feature as an option on any of our tubs with our hydro jet system. The aromatherapy system works by infusing oil into the hydro jet lines and fills your tub with the decadent scent that you have chosen creating a pleasant aroma for you to enjoy and relax in. 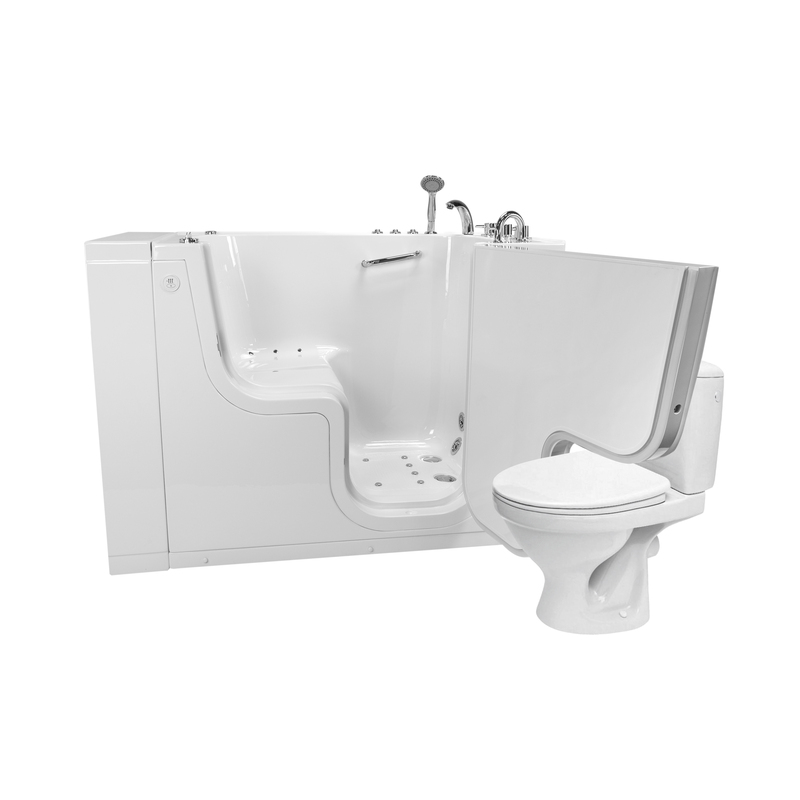 Our dual massage walk-in tubs have two air jets in the center of the seat. The U shape pillow is designed to accommodate these two bidet jets. If you want to cover bidet jets, you can utilize the regular seat pillow. This luxuriously thick pillow is incredibly comfortable and can be used as riser or additional seat support in all walk in bathtubs. The interior material is washable and can be removed. The Slimmer Transfer26 Wheelchair Accessible Walk In Tub was engineered to suit people who use a wheelchair and those with limited mobility. Bathers using a wheelchair can enter with ease from the side of the bathtub. The large entry through the wide, L-shaped outward swing door allows the bather to hold on to the deck- and wall-mounted pre-installed grab bars as they slide in or out of the walk-in tub bathtub. The Transfer walk-in bathtub is made with a textured, slip-resistant floor, 1 U-shaped, deck-mounted grab bar, and 1 interior sidewall-mounted grab bar. A soothing experience awaits inside. The 20” wide molded seat lets you bathe in a comfortable upright position. You’ll have easy access to your choice of faucet, optional premium feature controls, and the pull-out hand shower for a convenient bathing experience. Check out our variety of packages including features like the exfoliating Infusion™ Microbubble Therapy, soothing air, hydro, or dual massagers, and more.